ORLANDO – Houston will always hold a special place in the heart of D.J. Augustin for what the city did in 2005 when his family was forced to flee New Orleans because of Hurricane Katrina. Now, with Houston still in recovery mode following the devastating effects of Hurricane Harvey, the Orlando Magic point guard wanted to do whatever he could on Wednesday to help aid his adopted hometown in Southeast Texas. 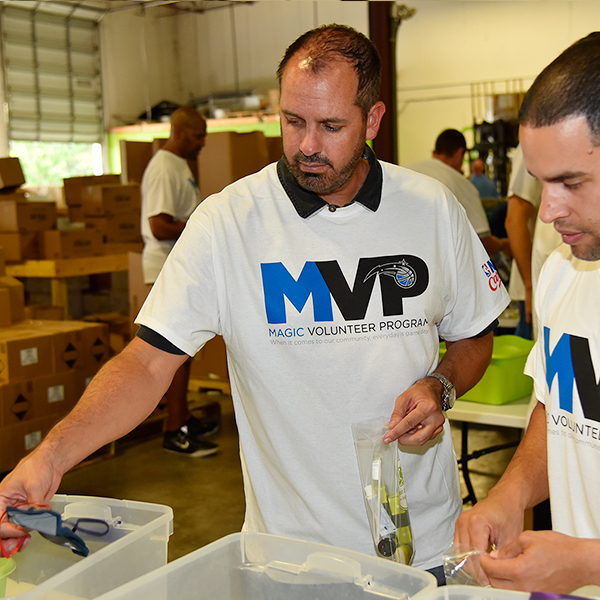 Augustin, joined fellow Magic teammates Jonathan Isaac and Khem Birch and the coaching staff, led by head coach Frank Vogel, to prepare disaster relief kits for those still reeling in Houston from Hurricane Harvey. And with Hurricane Irma tearing through the Caribbean and threatening Florida, the Clean the World Foundation is working overtime to try and ready hygiene kits for those who might need assistance in the coming days.